Countless reports have claimed that Samsung is going to offer the Galaxy Note 8 with 256GB of internal storage. Some have suggested that this particular model will only be offered in select markets. The 256GB Galaxy Note 8 has surfaced online yet again, this time in what appears to be marketing material for pre-order customers in South Korea. 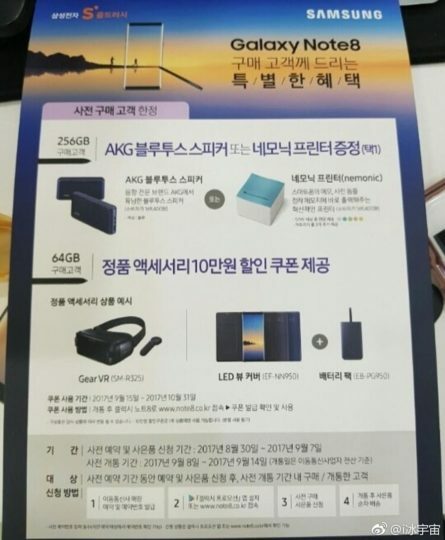 The leaked poster details the incentives that pre-order customers in South Korea will get if they put money down for the new handset. Those who opt for the Galaxy Note 8 with 256GB storage will be able to choose between an AKG Bluetooth speaker or a Nemonic printer. The 64GB model, which will be widely available to customers across the globe, will also be sold in South Korea. Customers who pre-order that model will receive a coupon of 100,000 won or $90 which can they use to purchase a Gear VR, a 5,100mAh fast charge portable battery back or a LED Cover for the Galaxy Note 8. Samsung’s pre-order incentives for the Galaxy Note 8 are going to vary by market so in some countries customers might walk away with a 256GB microSD card. The company is going to officially unveil the Galaxy Note 8 tomorrow so all of this will be cleared up soon enough. The Note should come in 64gb, 128gb, and 256gb models, plus MicroSD expansion. 6 or 8gb of ram. Some power users like to task their phones to the limits. The Note series is for power users, Sammy needs to acknowledge that and give us the power user options. It’s about time they increase the internal storage, 32GB? 64GB?? We’re not living in 2012! Apps and games are getting bigger and bigger everyday, not to mention all the updates for the system and every app/game that’s always available by the devs. This isn’t Apple. Samsung standard in flagships are 64GB w/ sd expansion. Is there a need? 128gb would be more than enough especially if you put in a 256 GB memory card.